Overview: Get comfortable, friends! 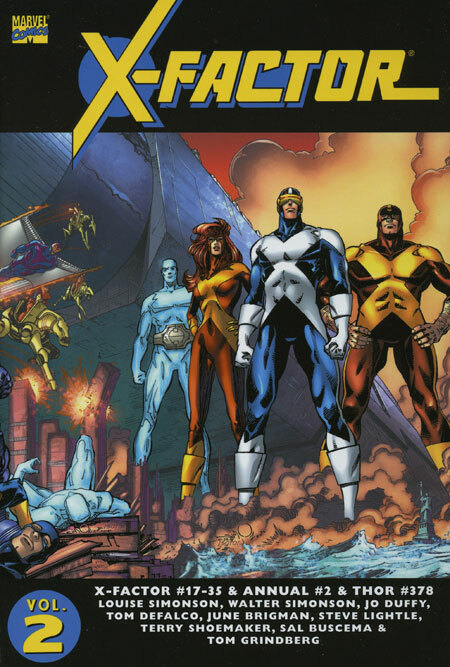 This is a must read volume of the original X-Men’s ongoing adventures as members of X-Factor. As you may recall, X-Factor appeared to be mutant-hunters, but they are secretly bringing in their captures to train them on how to use their powers. When we left off, it appeared that Warren Worthington III, aka the Angel, had committed suicide in despair over the loss of his wings. In all actuality, Warren survived and was brought back to life by Apocalypse, who outfitted Warren with a new suit and a new attitude. Taking on the name Death, he joins up with the other minions (War, Famine, and Pestilence) to form the Four Horsemen serving Apocalypse. The Four Horsemen take on X-Factor, who are shocked to see their former friend and team-mate squaring off against them. Warren is eventually able to overcome Apocalypse’s influence, and rejoins his team. He uses a variety of code names such as Death or Dark Angel before settling on Archangel. With Warren’s death, that left a hole in the team line-up, which was filled by the mutant Caliban, whose power is detect mutants. Caliban starts to despise his passive power, as he wants revenge against everyone who has done him wrong. Caliban takes advantage of the hole in Horsemen’s roster, and promises his loyalty to Apocalypse in exchange for the ability to gain the vengeance he seeks. Thus, Caliban becomes the new Death, once again replacing Angel. As much as we like the Angel storyline, there are other members of the team in this book. Cyclops still has to deal with the emotions of Jean Grey returning to life while at the same time dealing with his estranged wife Madelyne Pryor. That entire storyline will come to a resolution in the Inferno storyline, so stick around for Essential X-Factor Vol. 3. The Beast is really roughed up in this volume. During the battle with the Four Horsemen, Hank comes in contact with Pestilence, whose touch brings pain and infection. With the Beast, whose genetic formula is anything but normal, it reacts in the worst possible way, causing Hank to lose intelligence each time he uses his abilities. Bit by bit, Hank goes from the smartest member of the team to the dumbest, but his heart remains true to this friends. He protects Iceman from being kissed by the deadly Infectia, who can manipulate molecular structure through physical contact. However, given the previously mentioned screwed up genetics of the Beast, this causes adverse affects, eventually stabilizing his body into his blue beast form with his full intelligence returned. What makes this Essential? : This is a really good volume. From the storyline, we finally have a set of core characters that run through the issues in this volume. All of the characters are put through the ringer physically and emotionally. Not to demean either format, but this really feels like a TV soap opera. The stories may seem outrageous, but the goal is to bring you back to read the next issue (or watch the next episode) and it works. Based on the creators, this is the Simonsons at their best. This is some of Louise (Jones) Simonson’s most solid writing, and Walt Simonson shows why he is a modern master of the comic art form. If you like this volume, try: the Fall of the Mutants omnibus, which collects all of the issues of this “event.” Or maybe non-event. What makes this interesting is that even though the Fall of the Mutants banner was on the covers for X-Factor, New Mutants, and Uncanny X-Men, the events in the stories did not cross over with each other. We see the struggles that X-Factor goes through in this volume, and the “death” of the X-Men can also be read in the Essential X-Men Vol. 7. But to read the New Mutants story, you need to pick up this omnibus. While visiting their friend Bird-Brain, the New Mutants get into a battle between the Ani-Mator and the Right organization. During this battle, one of the New Mutants is killed. (As with all comic book deaths, you should add the words “for now” into the sentence.) This volume is a great way to read the events of the mutant books going on at one time, without the obligation of having to read all of the issues to understand the full story. This entry was posted in Marvel Essentials, X-Factor and tagged Louise Simonson, Sal Buscema, Walt Simonson, X-Factor. Bookmark the permalink.